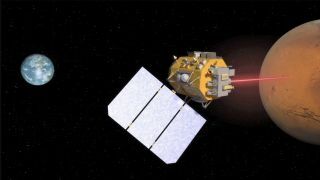 An artist's depiction of NASA's LCRD spacecraft using lasers to relay data from Mars to Earth. NASA officials say this type of technology could transmit data up to 100 times faster than current radio-frequency (RF) communications systems can. NASA is making strides toward launching its laser-based space communications system, which officials say could become the "high-speed internet of the sky." The system, called the Laser Communications Relay Demonstration (LCRD), will use a beam of light to send data to Earth from space and back up to 100 times faster than current radio-frequency (RF) communications systems can. This technology is also much smaller, meaning future spacecraft communications systems could possibly weigh less and require less power — critical factors in planning long-duration space flights to Mars and beyond, NASA officials said in a statement. LCRD builds on the successful Lunar Laser Communications Demonstration (LLCD) experiment performed by NASA's Lunar Atmosphere and Dust Environment Explorer (LADEE) spacecraft in 2013. At the time, the LLCD was the first of its kind to show the feasibility of high-speed laser-based communications systems beyond low Earth orbit. The LCRD will expand on that work to demonstrate the technology's operational durability and performance in varying weather conditions as well as its longevity, as the spacecraft is designed to operate for two to five years, according to the statement. An engineer works on an optical module for NASA's LCRD spacecraft. Now, engineers are testing whether each component can withstand launch conditions. The LCRD mission is scheduled to launch into space in summer 2019, when it will navigate to an orbit that matches Earth's rotation, also called a geosynchronous orbit, and will begin to communicate with laser modems at two ground-based terminals in California and Hawaii. The LCRD is equipped with a space switching unit (similar to a data router) which connects to two identical optical terminals and a radio-frequency downlink, allowing the spacecraft to convert digital data into a laser light that can, in turn, beam the data to Earth. The LCRD is also armed with actuators that will help to stabilize the spacecraft, ensuring that it's perfectly in position in the sky and able to communicate with the ground-based terminals in California and Hawaii. The optical module assemblies on NASA's LCRD spacecraft are tested for pointing accuracy. NASA is also planning to launch a laser terminal for the International Space Station in 2021, which will use the same laser-based technology to relay data from the orbiting lab to Earth at "gigabit-per-second data rates," NASA officials said in the statement. If all goes well, in the future, "many other Earth-orbiting NASA missions will also fly copies of it to relay their data through LCRD to the ground," NASA officials added.